The dates in this Moroccan Lamb recipe give a sweet twang to the dish, balancing out the spices perfectly. Mix the lamb with the oil, garlic, onion, ginger, cinnamon, black pepper, salt, saffron, turmeric and 7-spice powder. Heat a pot and brown the meat for a few minutes over medium heat. Add the water and bay leaf, increase the heat and bring to a boil, then cover the pot and reduce the heat to medium. After an hour, scoop out 1/2 a cup of liquid and set it aside. Put the lid back on and resume cooking for a further 1 1/2 hours till meat is tender and breaks away from the bone. (If necessary, add a small amount of water during cooking to prevent the meat from scorching.) Once meat has cooked, remove the lamb from the pot and reduce the liquid until there is only onions and oil left. Place the reserved liquid (from the step above) and the dates into a pot and cook over medium heat. Slowly stir in the sugar and cinnamon and leave to simmer for 5-10 minutes, till mixture becomes a thick syrup. Place the lamb on a serving platter along with the onion and oil. 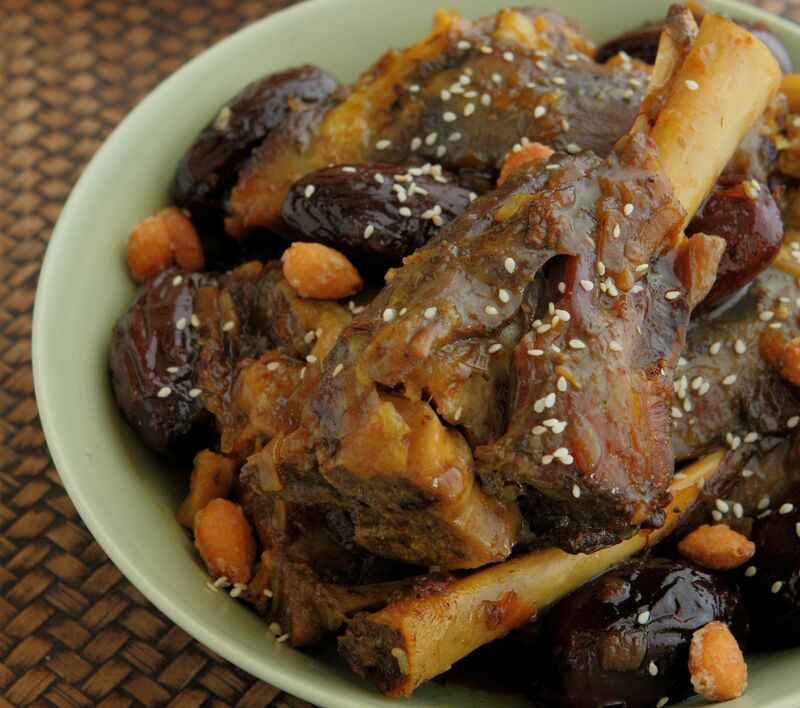 Top with a drizzle of date sauce and a sprinkle of sesame seeds and almonds. * Note: Ras Al Hanout is a spice blend that originated from North Africa.